Shake a leg, laugh out loud and sing along to five best-loved and lively songs by the incomparable Topp Twins. 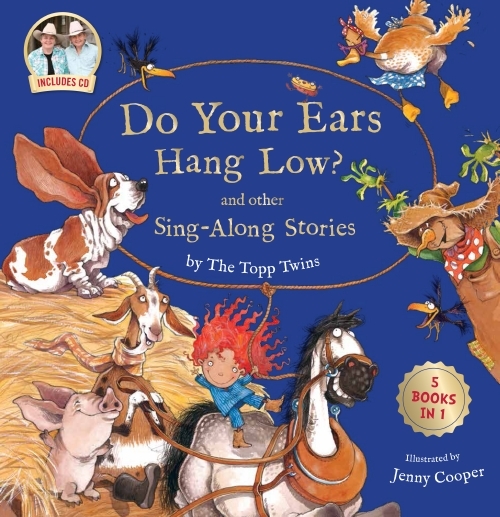 This collector’s treasury includes: Do Your Ears Hang Low? ; There’s a Hole in My Bucket; The Farmer in the Dell; She’ll Be Coming Round the Mountain; and Dingle-Dangle Scarecrow. Born in Wellington and live in Christchurch, and I am now trying to find a bit of land in the country for myself, my partner Chris, our cat, plus chooks Elsie and Hilda. Wadestown Primary School in Wellington, then Fendalton Primary in Christchurch. I was quiet, I think, but had some very good friends whom I still see today. A friend once dared me to drink out of the gutter, which I did (more silly than naughty, I think!). My favourite thing in school was drawing—title pages, posters, projects, maps on the blackboard, doodling in the margins. Once, my best friend and I made complete sets of teeth, upper and lower, out of dried PVA glue and spent hours of every day drilling them with protractors and filling them with pencil lead. Weird! I read heaps, under the bed covers, sometimes reading all night, eating granny smith apples...the usual books for girls my age, plus Moomintroll (so sad! ), The Little Prince by Antoine Saint Exupery, and the best book ever written, The Phantom Tollbooth, by Norton Juster. Margaret Mahy...I still read Dangerous Spaces every year...she was so interesting, funny and intelligent and had a way of turning everything on its head...always looking at things from unexpected angles. If you said you'd walked through a spider's web, she would instantly come up with a story from the spider's point of view. Favourite food? Food is ALL good and gets my full attention. Colour? Colour is my work, I love them all. Movie? Strictly Ballroom! Lots of women my age love that movie...check with your Mum! author; she showed me that ordinary people can get their work published. there. The book was really bad, and my second book was worse, but they were enough to get me started. I really couldn’t help myself, illustrating chose me; I was born with a strong need to draw. It was my best skill, so I turned it into a job. I think illustrators are interested in everything, and are always looking for ideas everywhere they go. My brain automatically stores what it sees, for later use, whether that is a bizarre hair style, a particularly floppy dog, a really big nose or a beautiful mix of colours. Mainly I draw what I am interested in, and I hope that other people are interested in it too. Yes, a lovely sunny studio with walls covered in pictures, and lots of biscuit crumbs on the floor. There are so many good things! Sometimes I feel very proud of my work, which is a great feeling. I also love working from home, it gives me lots of freedom, although it can get a bit lonely. I love the feeling of learning every time I begin a new book. I also like all the people I work with; I have never come across a grumpy or horrible editor. Have you had a funny or embarrassing moment as an illustrator? Once I thought I had set fire to my studio, it was full of smoke. I called the fire brigade, who came rushing around, lights flashing ... but it turned out I had only boiled the jug dry. Once I was rushing to finish a book and get it onto a plane flight in half an hour, when I spilled a bottle of black ink all down my desk and onto the carpet. I flooded the carpet with water, covered everything with heaps of towels, and kept working on the edge of the desk, because I had to finish that book! Reading, gardening, doing up old furniture, making lamps, mosaic, papier mache, sewing and doll design, restoring old tools and any old bits and pieces I buy second-hand...you know, all the good stuff! Plus seeing my friends and family, of course! An artist or craftsperson, or perhaps a teacher. Edmund Dulac, an illustrator from around 1900. I want to watch him work and find out how he did such amazing paintings. I would suggest that if you think you might like to be an artist of any sort, the best thing you can do is to draw, anything you like, in your spare time. That is the best art school you will ever have.